I guess it's time to rank Delvin Zinn higher than I thought I would on a post-season top 30 list. .333/.419/.410 in 78 August at bats with 11 BB against 18 Ks. The walks have skyrocketed in the last month. In 174 second half ABs he's .299/.351/.345 with 12 BB and 32 Ks. I know he was thought of as a defense first guy when he was drafted in the 23rd round in 2016. (Cubs drafted him in 2015 as well, so they must've liked what they saw.) He's played, 2B, SS and 3B about the same amount this season. Could be a Ronny Cedeno type utility man if he can keep hitting and add a little pop. I'm planning on watching Little start later tonight to see if he was doing anything different or just got lucky in his 5 inning shutout start today. I wonder about what the Cubs do with higher draft pick arms at the lower levels. There's somewhat of a pattern here that I want to look into. Probably nothing. Austins Upshaw and Fillere sure fell off the map the season. Still not sure what the Cubs have in Erick Leal, but the numbers sure are encouraging. That AA rotation next year should be fun. Lange, Abbott, Miller, Leal and Clark could all be in that rotation. Due to the logjam in Iowa (assuming not cuts/trades), the Cubs could holdover Swarmer and Thompson pushing Clark and Leal to the pen to start the season. CubsWin wrote: Austins Upshaw and Fillere sure fell off the map the season. Clark could start at high-A since he hasn't had that many innings at Myrtle Beach this year. 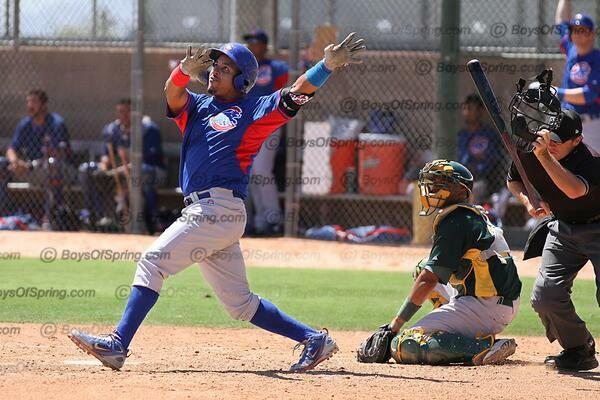 AZL Cubs 1 won their 1-game playoff 8-7 in 10 (heh) on a walk-off walk. First playoff game with the new extra innings rules. Yonathan Perlaza had a really nice season this year. He may be a tad underappreciated by us on here.